Bangladesh embassies, consulates, high commissions, permanent missions in different countries and international organizations represent Bangladesh and its people. These missions are controlled by Bangladesh Ministry of Foreign Affairs (MOFA). According to MOFA’s website, a total of 65 embassies, consulates, high commissions, deputy high commissions, permanent missions are stationed in 51 countries. (List below. However, this list may not be updated!) All these foreign missions have physical location (buildings, offices) and many have online presence (websites). Through their physical and virtual locations these foreign offices provide various kinds of services to people. This article, in general, will review the state and effectiveness of the websites of Bangladesh embassies and consulates. It will touch upon the language, social engagement, quality of information, management related issues. At the end, it will attempt to provide some suggestions. At present, there are 48 embassies, consulates, high commissions, deputy high commissions, permanent missions of Bangladesh government can be found online (Sources: MOFA website and internet search). A gallery of screenshots of Bangladesh Embassies and Consulates can be found here. Due to lack of information regarding the website policy of Bangladesh Ministry of Foreign Affairs (MOFA), this article has to rely on WYSIWYG method to write about the conditions of websites. Nomenclature? Bangladesh embassies and consulates have adopted various kinds of name for different missions. For example, bdembassy, bangladeshembassy, bangladoot, bangladesh, bdembassyuae, cgbdubai etc. Acquiring and implementing a systematic, well-organized, appropriate top-level domain (TLD) policy is vital to any website. At the government level, it is also a question of public trust, national security and standardization. Bangladesh Ministry of Foreign Affairs has not secured and implemented any consistent domain name plan for its foreign mission websites. All websites of Bangladesh embassies and consulates are in English. None of them has Bangla language support except Bangladesh Embassy in Nepal. Other missions sometime post government circulars, notices, press releases, directives, etc. in Bangla. However, they are all in jpeg or pdf format. Considering its international importance, English is a right choice. However, considering Bangla language is a big issue in Bangladesh and possibly most of the visitors are of Bangladeshi origin (an unscientific assumption! ), and it is a national language of Bangladesh, all websites could have been supported with Bangla language. And if possible, all websites can provide local language support as well. For example, Bangladesh Embassy in Japan can be in Japanese language, beside English and Bangla. Ironically, Bangladesh MOFA website is completely in English but they have attempted Bangla language support! Interestingly, Bangladesh Embassy in Uzbekistan has Russian, Bangladesh Embassy in Turkey has Turkish language and Bangladesh Embassy in China has Chinese language support. Social media, like Facebook, Twitter, YouTube, Google+ etc. are powerful tools to connect and stay in touch with clients or fans of any service organizations. Almost no Bangladesh embassies and consulates have social media connections except Kenya (Facebook) and Nepal (Facebook, Twitter, Google+). Interestingly, Bangladesh Embassy in Kuwait has no website but only Facebook page! All MOFA websites have serious consistency problem in regard to information and website structure. The information provided in various websites of Bangladeshi missions abroad are widely varied. Basic information about Bangladesh, economy, culture, tradition are not uniform. In some instances, they are missing. Bangladesh Embassy in Sweden and Turkey: ‘Contact Us‘ on top right horizontal level. Good. Bangladesh Embassy in UAE: ‘Contact Us‘ is on the footer only!! Bangladesh Embassy in Saudi Arabia: there is no ‘Contact Us‘. If they have, it is HARD to find. Bangladesh Embassy in Sri Lanka: ‘Contact Us’ is not on navigation menu, just pasted at the front page. Easy to lost. Website structures can be different but all must pass usability test and be user-friendly. Navigation does not have to be same or even similar, but it must be intuitive in nature. ‘Keep looking until you find’ policy is not a great idea. Who controls Bangladesh embassy and consulate websites? According to MOFA website, Kuwait, Lebanon, Myanmar, Nepal, Philippines, Qatar, Sri Lanka, and Thailand have no websites. However, they have websites and can be found online. 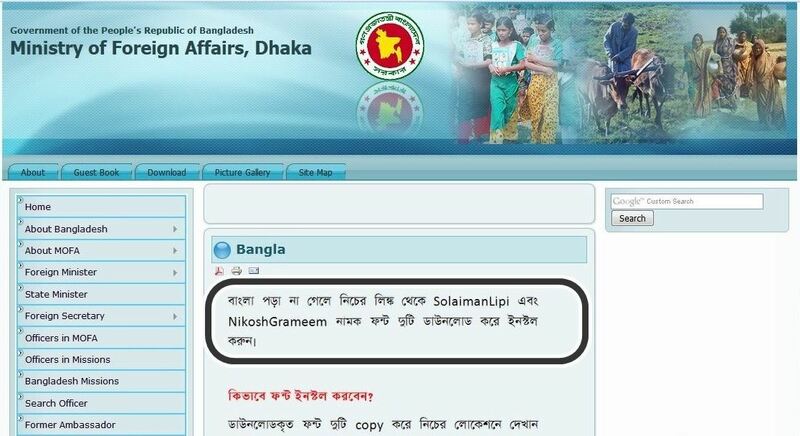 Is Bangladesh MOFA in control of these websites? or Is this simply a lack of update issue? There is no information about Bangladesh Consulate in Milan, Italy on MOFA website. However, one website of Consulate Milan was found online! The website works and seems legitimate but question remains why there is no information about this consulate on MOFA website? If these websites are owned and controlled by Bangladesh MOFA, as a rule of thumb, that information should be mentioned. Allowing person’s or organization’s name to appear on a government website is not professional. At the time of writing this article, at least 19 MOFA foreign mission websites have the name of a person or organization printed at the footer – including some foreign web developers. Even at the footer of MOFA’s own website has personal seal of a creator! Nothing is wrong in mentioning who is the designer or developer of the websites, however, it is very unconventional for a government website. Proper control and maintenance of Bangladesh foreign mission websites are a national security issue. Sites are not secured (https) to do any data transaction, if necessary, etc. China, Honk Kong bangladeshconsulate .hk English No No information, only random and bad links. 3rd person Facebook link! Greece bdembassyathens .gr English No Yes, D.F. India, Delhi bdhcdelhi .org English Yes, Facebook, Twitter, YouTube Yes, Mrnproductions MOFA website link has different info. Italy, Milan bcgmilan .com English No Yes, Kamrul Hassan MOFA website has no info about this office! Japan bdembassy .jp English No Yes, Arefin Tuhin MOFA website link has different info. MOFA link is a fashion site! Lebanon bangladeshembassybeirut .org English No Yes, Drivs av Abstra This website is not listed on MOFA website. Myanmar, Yangon bdembassyyangon .org English No Yes, BUZZ This website is not listed on MOFA website. Philippines bangladeshembassymanila .org English No Yes, I-Map Websolutions This website is not listed on MOFA website. Sri Lanka bhccolombo .lk English No Yes, Zeeron Solutions This website is not listed on MOFA website. Switzerland bangladeshmissiongeneva .ch -- -- Permanent Mission to UN offices. Forever in maintenance! Thailand bdembassybangkok .org English No Yes, G7website This website is not listed on MOFA website. United Arab Emirate, Dubai cgbdubai .org English No Yes, Alwafaagroup This website is not listed on MOFA website. Vietnam bangladeshembassy .vn -- -- -- Hacked! General information about Bangladesh history, politics, geography, culture, tradition, literature, government structure, investment policy, etc. can be furnished by Bangladesh MOFA. Those information can be data-rich, synchronized, well researched. Rest can be given to each mission to add information according to their need. Website structure can be professional, user-friendly, modern and if possible, aesthetically appealing! When possible, rating system, FAQ, QA, social media sections can be added to better serve the clients. All websites should be made responsive and mobile-friendly as more people are accessing web via cell phones and tablets. Copyright, terms and conditions, disclaimer etc. should be clearly stated in all websites of Bangladesh MOFA foreign missions. All foreign missions can have web presence. At present, 17 embassies and consulates have no websites. Online presence of nation like Bangladesh is very important as more and more people are seeking information online. For many investors, tourists, researchers, expatiates, businessmen a website is the first and prime source for information. Therefore, it will be wise for Bangladesh MOFA to create fast, secure, accurate, comprehensive and working websites for all of its embassies and consulates as soon as possible, including its own. Excellent Article. I’m owner of digital agency in England and being of Bangladeshi origin. I totally agree with your article I’ve noticed from my personal perspective that the current state of BD government website are really outdated with lack of organisations. It really wish the Government would do better improve the web presence of the country to promote trade and investment & tourism. Bangladesh Consulate Milan is now http://bcgmilan.it/, not .com anymore! Do Bangladesh has any embassy in Denmark?